Tonight marks the return of Rajon Rondo, one of the most enigmatic and entertaining players in the league. The Celtics are in desperate need of a boost. So is the Eastern Conference, for that matter. Rondo will hopefully provide that, but big questions remain about his health and his ability to shine in a post-Ubuntu world. Rondo grew up in a point guard’s dream, winning a title and dishing out assists to future Hall of Famers at literally every position on the court (if you count the Shaq era). But those guys are all gone now, and Rondo is left as the chief operating officer of Boston’s fledgling start-up franchise. More than ever, that New England spotlight will shine down upon him. More than ever, he’ll be the subject of Tommy Heinsohn’s grandfatherly praise and Michael Felger’s drive-time trolling. Whether he wants to be or not, Rondo is now the face of the Celtics organization. Rondo will bear an unfamiliar scoring burden upon his return and, more than ever, his infamous jump shot will be on full display. Since arriving in the league, Rondo has had a reputation as a bad shooter, but is that still a fair characterization? 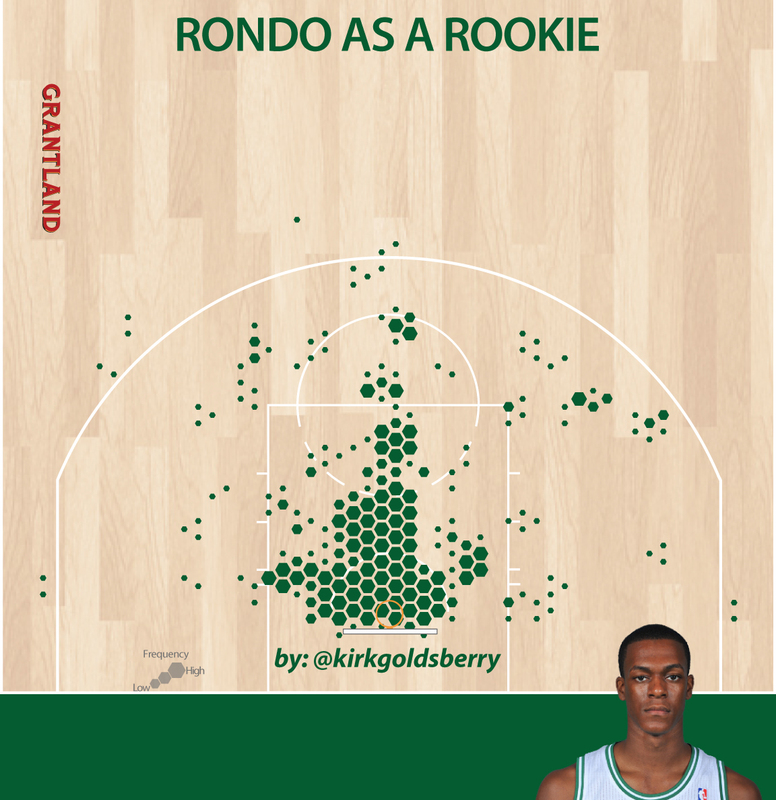 Back in his rookie season, Rondo seemed tentative shooting the ball. Almost two-thirds of his attempts occurred close to the rim, and on the few occasions when he did take jumpers, he met those low scouting expectations. He made just 29 percent of his shots outside of eight feet, including only 21 percent of his 3-point attempts. 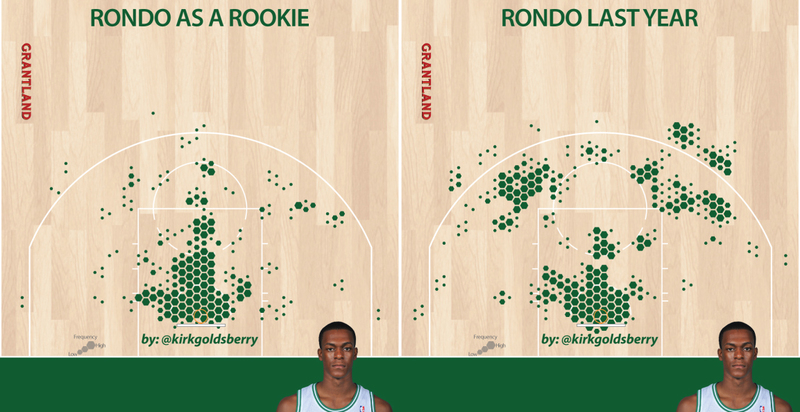 But things slowly changed, and Rondo has gradually grown more comfortable as a jump-shooter. Comparing his most common shooting locations between his rookie season and his injury-shortened 2012-13 season reveals a stark difference; he has morphed from a timid rookie who was afraid to shoot away from the hoop into a guy more than willing to shoot 17-footers beyond each elbow. Before his knee injury last year, Rondo was essentially scoring from four distinct areas: near the hoop (where he’s crafty and effective for his size), beyond the arc along the left wing (where he’s not good), and off both elbows (where he is really good). 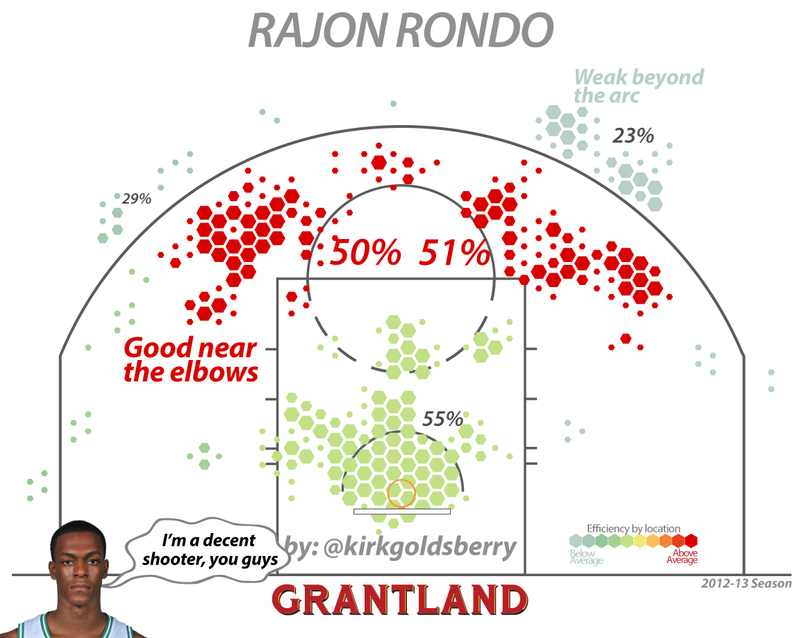 Rondo was actually one of the best elbow shooters in the league last season. 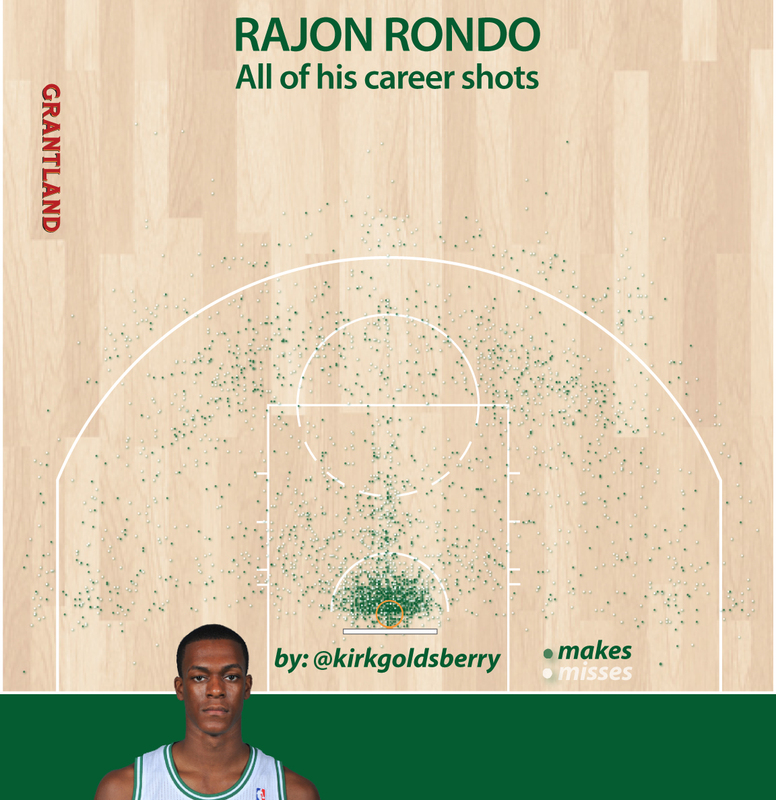 Out of 141 NBA players who attempted at least 100 shots from the elbows, Rondo ranked fourth in field goal percentage in that zone — trailing only Jason Smith, Steve Nash, and Jose Calderon. Those are pretty good numbers for a guy who can’t shoot. Per Synergy Sports, he also earned a “very good” rating for shots off the dribble, and an “excellent” rating for long 2-point jumpers. The NBA remains a pick-and-roll league, and Rondo has become a pick-and-roll demigod in part because he has worked to develop that reliable midrange jumper. But as of last year, lots of defenders were still sagging off him, or going under the picks, and as a result many of those elbow shots were uncontested. So, while he has put up really efficient numbers, they are arguably inflated. Unlike many of his “elite” point guard peers, some opponents still dare Rondo to shoot — nobody dares to dare Tony Parker or Chris Paul to shoot. Moreover, last season the Celtics were still decorating the perimeter with dangerous shooters including Kevin Garnett and Paul Pierce, and it remains to be seen if defenders will be as spatially generous with Rondo in the absence of those guys. Still, in a league full of bad shooting point guards, I think it’s time to take Rondo off our “can’t shoot” list, and maybe redirect our brick-laying scorn toward the point guards in Charlotte, Minneapolis, or Oklahoma City. Rondo has limited range, but as Parker has demonstrated, you don’t need to shoot 3s to dominate at the point guard position.